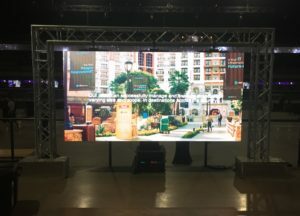 Our LED screens come in several different sizes to fit all events. To help choose the right Jumbtoron for you, know approximately how many people will attend. And how far away they will be. With this information we can give you some sizing best practices. Think of it like a printing press that prints with dots. The closer the dots, the better the resolution. In LED screens it is measured in space between the dots. The lower the number, the closer the dots and the better the resolution. IT is common for LED screens to have pixel pitches between 2mm – 20mm, with 2mm being a very high resolution typically only used indoors. This question is between mobile vs modular. What makes the most sense. 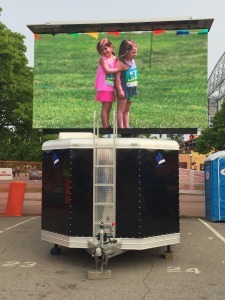 For indoor events typically modular screens work best. Modular tiles are like lego blocks. We bring them in a rolling travel case, and they are flown from rigging points, or stacked from ground supported hardware. 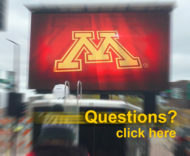 For most outdoor jobs mobile video boards are the best option. They are housed inside of enclosed trailers. When we arrive we set the trailer, and the screen is already built on a lift. When deployed, the screen goes right through the roof of the trailer.